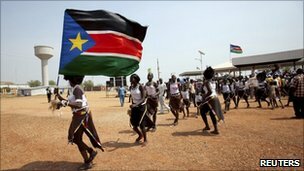 The governing party in southern Sudan – the SPLM – has for the first time publicly backed independence for the south, ahead of next month’s referendum on the issue. The statement is at odds with the terms of a 2005 peace deal that ended decades of civil war with northern Sudan. In that deal, the SPLM and the north’s governing party, the NCP, agreed to work for unity. But a senior SPLM official said the NCP had made unity look very unattractive. The official, Anne Itto, said the SPLM would now campaign for separation. “Since unity has not been made attractive, we are promoting what our people choose because we are following the people,” she said. She made it clear she was talking on behalf of the southern part of the party, and not its smaller section in the north. The BBC’s James Copnall in the Sudanese capital, Khartoum, says the momentum towards southern independence appears unstoppable. He says little has been done by the former rebel SPLM or the NCP to make unity attractive. Tensions are high in the run-up to the vote, with the SPLM accusing the north of several small-scale attacks on the south, while the military in the north has denied the charge. In a separate development, the man in charge of organising the south’s referendum, Mohammed Ibrahim Khalil, warned that opponents of the vote were trying to undermine it, by filing spurious legal challenges. “The whole idea is to create confusion and give the idea that something serious is going wrong,” he said. He declined to say who he thought was behind the campaign of disruption.